The seven festivals and celebrations in the Old Testament were appointed and ordained by God to be kept to honor His name: Passover, the Feast of Unleavened Bread, the Feast of Firstfruits, the Feast of Weeks, the Feast of Trumpets, the Day of Atonement, and the Feat of Tabernacles. They were to remind the Israelites each year of God’s ongoing protection and provision. But, even more importantly, they foreshadowed the redemptive work of Jesus Christ. Not only did they play significant roles in Christ’s earthly ministry but they also symbolize the complete redemptive story of Christ, beginning with His death on the cross as the Passover Lamb and ending with His second coming after which He will “tabernacle” or dwell with His people forever. 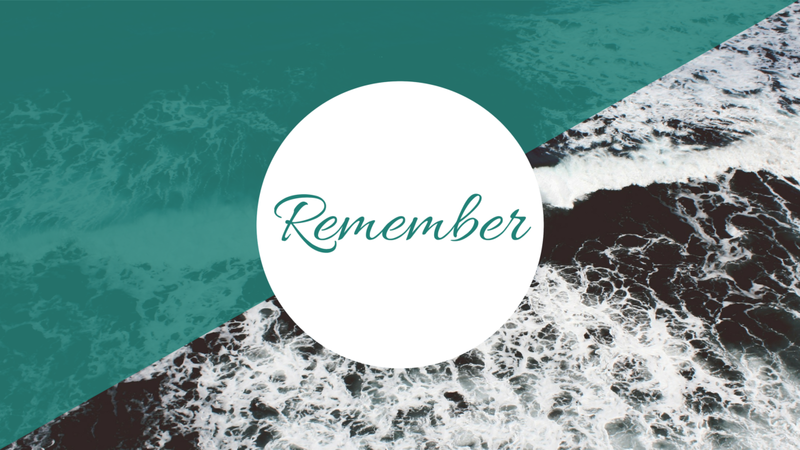 Remembering is important to God. Remembering His promises and all He has already accomplished in our lives means we honor Him. So often at the beginning of a New Year, we make promises to ourselves, “resolutions” that we will do this or that, and so often shortly after, we’ve already failed to keep the promise. But God. This sentence starter is used 612 times in Scripture! We fail, BUT GOD does not. We don’t keep our promises, BUT GOD does! Remember! Satan would have our memories blurred, burdened with the troubles of today. BUT GOD says His mercies are new EVERY DAY! Remember the mercy He’s shown you throughout your life! The enemy says you’re not worthy, unlovable, BUT GOD, through His sacrifice of Jesus, says remember! I have a “long memory.” I remember family times as a child with my sister and two brothers; I remember certain details about school and friends others have forgotten. I hold onto friendships a long time and love deeply. My prayer is that my memories will always include all my Heavenly Father has done. My resolution is having stones of remembrance.